This outstanding cooperative band is truly an aggregation worthy of wider recognition. The best concert of this year’s Festival. The band sounds extremely tight, as if played by one person on five instruments at the same time. One of the more formidable groups to emerge on New York’s modern jazz scene, OPUS 5 is a remarkably empathetic cooperative band featuring trumpeter Alex Sipiagin, saxophonist Seamus Blake, pianist David Kikoski, bassist Boris Kozlov and drummer Donald Edwards. Together these kindred spirits, all bandleaders in their own right, strike a balance between thoughtful composition and passionate improvisation on their two potent Criss Cross recordings, 2011’s Introducing OPUS 5 and 2012’s PentaSonic. Sipiagin, who has recorded 12 albums as a leader, began playing with the Gil Evans Monday Night Orchestra at Sweet Basil in 1992, and became a member of the George Gruntz Concert Jazz Band in 1994. He joined the Mingus Big Band in 1995 and has remained in that Grammy-winning aggregation to this day. 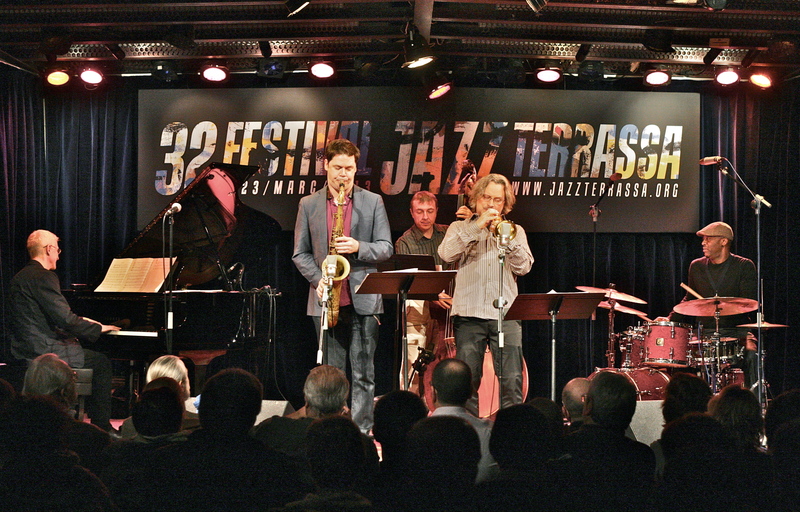 Since 1999, he has also been a member of Dave Holland’s various small groups and big band and credits Holland with being a significant influence on his own compositional style. Sipiagin also recorded and toured with the late Michael Brecker’s Quindectet in 2003. Blake, a winner of the 2002 Thelonious Monk International Jazz Competition for Saxophone, has recorded thirteen albums as a leader. Born in England in 1970, he grew up in Canada and studied at the Berklee College of Music in Boston. After relocating to New York, he began working with drummer Victor Lewis and later toured in John Scofield’s band. He joined the Mingus Big Band in 1995 and has recorded six albums with that acclaimed outfit. Kikoski, who has twelve albums as a leader and has appeared on over one hundred CDs as a sideman, was a member of Roy Haynes’ band for 15 years. He toured and recorded with a whole host of artists, including Randy Brecker, Bob Berg, Billy Hart, Al Foster, Ralph Peterson, Jeff “Tain” Watts, Toninho Horta, Eddie Henderson, Joe Locke and Criss Cross label mates Sipiagin and Blake. He’s been a member of the Mingus Big Band since 1997, appearing on four albums with the group. Bassist Kozlov has been the backbone of the Mingus Big Band since 1999, appearing on five albums with the group. He has two albums as a leader and has also appeared on recordings by Brian Lynch, George Colligan, Jean-Michel Pilc, Ronnie Cuber, Jack Walrath, Conrad Herwig, Dave Samuels, Bobby Sanabria and Roswell Rudd. Drummer Edwards, a Louisiana native, moved to New York in 1998 and joined the Mingus Big Band in 2003. He has two albums as a leader and has appeared on recordings by Orrin Evans, Jesse Davis, George Colligan, Mark Whitfield, The Mingus Big Band/Orchestra/Dynasty, Conrad Herwig, Jack Walrath, Joey Calderazzo and Ralph Bowen. The idea of these five colleagues banding together came about a year and a half ago. As Kozlov recalls, “Alex and Seamus were sitting at the bar in an airport somewhere and they both said, ‘Why don’t we make a band that features everybody and where everybody brings in music,’ And everybody was on board with it.